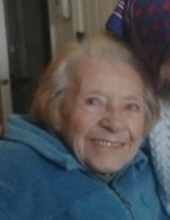 Ruth M. “Boots” Hermansen (nee Barke), 91, went to be with her Lord on February 2, 2019 at Rocky Knoll Healthcare Facility where she was a resident for the past few months. Ruth was born on September 19, 1928 to Bernard H. and Lydia E. (Kadlec) Barke in Milwaukee, WI. Ruth attended grade school and graduated 8th grade. Ruth met Harold W. Hermansen, the love of her life in Milwaukee in 1965 and moved to Parnell where they started their business located on their property. Their business was making and repairing saddles harnesses and other western apparel. They called the business “Hells Half Acre.” Ruth was proud of her nickname "Boots", as she wore cowboy boots when she was young. Ruth and Harold had no children. Ruth was an avid painter and gardener. Her love of animals showed as she took care of horses, many cats that lived and visited her property and her dog named Doggie. Ruth is survived by her sister Deloris K. Barke of Plymouth, who has always been close to her, her nieces: Kathleen and Susan, close friends Jenny Buelow and Sharon Kneeland who assisted her and Deloris with their shopping and other life situations for the past few years and many other friends. Ruth was preceded in death by her beloved husband, Harold W. in 1991, her parents, sister Eileen, nephew Jeffrey, her uncles John and Herbert, aunts: Gladys and Adeline, brother in laws Lorenz, Elmer, and Arthur. According to Ruth's wishes cremation has taken place and there will be NO VISITATION OR SERVICES. A memorial fund is being established in Ruth’s name. Deloris would like to especially thank the girls of the Rocky Knoll staff for taking wonderful care of Ruth. To send flowers or a remembrance gift to the family of Ruth M. Hermansen, please visit our Tribute Store. "Email Address" would like to share the life celebration of Ruth M. Hermansen. Click on the "link" to go to share a favorite memory or leave a condolence message for the family.